Towards a “Global Britain”: Challenging the New Narratives of National Decline takes aim at the rise of new declinist narratives. 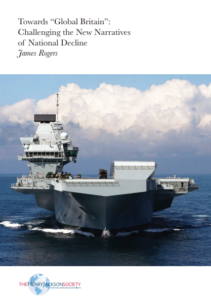 The report sets out why Britain has strengths across a range of areas that will empower it in the years ahead, including in its economy, military and culture. The Global Britain Programme at The Henry Jackson Society shows with its inaugural report – ‘An Audit of Geopolitical Capability’ – that Britain is a cultural superpower, second only to the United States in its ability to propel liberal and democratic values around the world. There is endless talk about Britain being ‘finished’ as a major power as a consequence of Brexit. In fact, we remain the second most powerful country in the world across a basket of indicators. We now need a Global Britain strategy to accompany this reality, providing the springboard for future national success into the Brexit era. Declinist narratives are never productive. They sap at any nation’s confidence and wellbeing. Irrespective of one’s stance in relation to ‘Leaving’ or ‘Remaining’ inside the European Union, we need at this moment concrete suggestions and proposals that seek to empower the United Kingdom as it accelerates its withdrawal. At the broadest strategic level, this is what our latest report tries to do. It explains how declinists have often been wrong before; it explains Britain’s unique national geopolitical strengths; and it proposes solution to capitalise on those strengths. To download the “Geography of British Power” map, click here.